Hermy's sells & services thermostats in the Rapid City area. 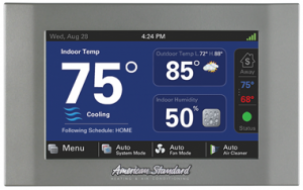 There are many different thermostats offered by American Standard that typically fall into two categories: traditional and connected controls. The traditional thermostats are affordable and many come with the ability to program and schedule what temperatures you want for specific times. The connected thermostats add a little more functionality, including the ability to remotely control not just your home’s temperature but a bevy of Nexia-compatible smart home solutions including lights, locks and more. Your home’s comfort level isn’t a one-size-fits-all deal. Every home has different needs, and American Standard offers a variety of products, solutions, and prices to meet those needs. These affordable products and solutions also include energy-efficient thermostats that are designed to help you heat and cool your home.